In 2013 we published more articles than ever before. Here’s a list of the top 11 articles from 2013. [/twocol_one] [twocol_one_last]The Best Handgun Caliber for Your Concealed Carry Weapon? The age-old question that most of us shooters face is what is the best caliber handgun to carry concealed for self-defense purposes. As you would imagine, there are as many opinions about this as orifices in our teeth and many “experts” disagree on a specific caliber answer. The question itself and the answer are controversial. Some say the question should not be asked because there are just too many possibilities and variables and caliber is not a primary variable. [/twocol_one] [twocol_one_last]The Ideal Concealed Carry Gun: Myth or Reality? 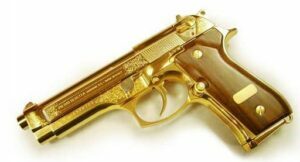 I have searched and am continuing to try to discover the ideal Concealed Carry (CC) gun for myself, like many do. This is proving to be a very challenging task with a lot of dynamic variables, like when Al Gore “created” the Internet or when Thomas Crapper developed the flush toilet. Is there really a one best or ideal gun for carry purposes? 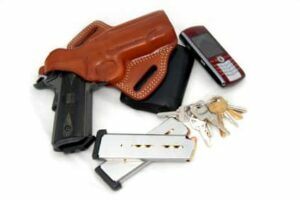 The starting place for me was to define the characteristics and features of what I preferred in my carry gun. Why is law enforcement switching from the .40 and .45 back to the 9mm? Well, as one article I read stated about a police department in Sioux Falls, SD, “they’re trading in their .40 caliber handguns for 9mm pistols, citing lighter recoil and greater capacity…” Yes, the 9mm has lighter recoil and yes you can carry more rounds in your magazine, but the main reason to switch is that due to advancements in bullet technology the stopping power of a 9mm is now about the same as a .40. What is “brandishing” a firearm and what are the considerations, laws, definitions, elements, penalties, required proof, etc.? When does brandishing or a careless or inadvertent exhibition of a firearm occur? What should we do to avoid it? Does it require showing that the person committed the act willfully, intentionally and with knowledge or just that the person accused acted “carelessly.” What is a willful, threatening, and/or careless act with a firearm? Recently, a man and his wife were driving through Brooklyn, NY. They were sitting at a stoplight when a group of 10 teenagers started crossing in front of them. The light turned green and the teenagers were still in the road when the man honked at them to move out of the way. As soon as he honked, the youths started kicking and pounding on his car. He got out of the car to assess the damage and they turned their attack on him. He was severely beaten by the pack of teenagers and according to the news, he had a fractured nose, broken septum, and multiple bruises on his body. Right now, I have four guns in the rotation of what I carry on a daily basis. I don’t rotate these guns daily and some of them I carry more often than others, but throughout the month each one of these guns is likely to be with me at some point. The first gun is a Ruger LCP and I find myself carrying this gun more and more often these days. I carry it in my front, right pocket in a kydex holster. The reason I carry this gun so often is because it’s easy and convenient to slip in my pocket when I’m heading out. I also carry this gun in a bellyband every morning when I go for my daily run. This gun carries 6 + 1 rounds of ammo, which I am completely comfortable with. 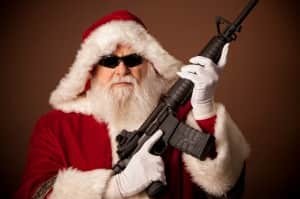 Do you have a gun owner on your Christmas gift list? While ammo and cleaning supplies are always appreciated by any gun owner, maybe you’ve done that already and are looking for something else to surprise that person with this year. Here is a list of 10 items that your gun enthusiast would love to find under the Christmas tree. As most of us know, we have the right to remain silent once read our Miranda rights by law enforcement officers, in the event we are arrested and/or under suspicion for a shooting or a crime. However, a recent major U.S. Supreme Court decision on June 17th, 2013 changed this based on the Salinas v. Texas Case. Here is the general issue: what if we have not been arrested and haven’t been read our Miranda rights and we are merely being questioned? Can we remain silent? 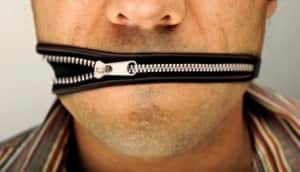 What this 5-4 Supreme Court decision means to this lay, non-attorney person is that in order to invoke your right to remain silent you have to initially speak up first. Confusing? 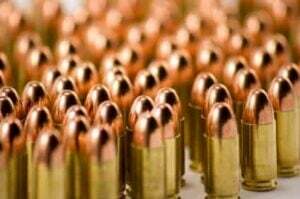 Is It Safe to Store Guns and Ammo in a Hot Car? 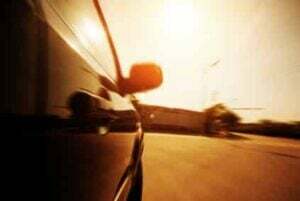 [/twocol_one] [twocol_one_last]Is It Safe to Store Guns and Ammo in a Hot Car? 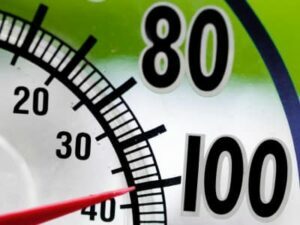 Recently, we had a heat wave in Southern Utah and there were a string of 100-degree days. Thankfully, I’m a little bit north of Las Vegas so it didn’t get to 110, but it was still extremely hot. When it gets this hot over the summer I often get several questions about storing a gun and ammunition in a car, and if it’s safe to do. Let’s start with storing ammunition first. If you’re using quality factory ammunition then you can store it in your car all summer long and it won’t be a problem. A lot of people believe that if it gets too hot in the car the ammunition will explode and you’ll have the Fourth of July inside your vehicle. Most shooters like to carry a single-action-only or 1911-style pistol a certain way to best balance readiness with safety. Some shooters like to carry “Cocked and Locked” (CL) and some do not. Some believe that carrying CL is very scary, a definite safety hazard, and they don’t feel comfortable doing so. 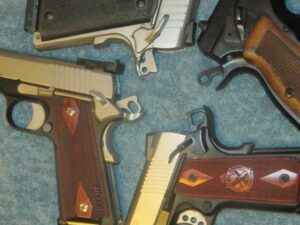 The mode of readiness and safety preferred by almost all of the experts for 1911s and most single-action pistols is called “Cocked and Locked.” There are several considerations, concepts, and pros and cons to understand in making your own decision. 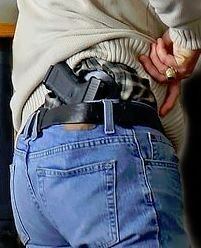 Why do you carry concealed? This is a good reason, and a better reason to practice your shooting… On Friday, 5 July 2013 I found out how important it is to have a “Standard” to your carry of a concealed firearm and just as important, maybe more, than the type of firearm that you carry, to practice with it and become thoroughly comfortable with it. I have been carrying for 35 years and a shooter for over 45 years. Next articleDouble Action or Double/Single Action Gun?